We’re gearing up for a big anniversary bash coming up on Saturday, September 26th. While Pops is celebrating it’s 79th Year in San Francisco, we’re celebrating 1 Year of our Music for the Mission line up. In the next couple of weeks come out and celebrate the best of Pops entertainment leading up to a huge 10 HOUR CELEBRATION on the 26th. It’s been a great year for us in the mission and we couldn’t do it without you! It’s only Monday if you treat it like one. Join us every Tuesday of the month and test your wits at Pops trivia night “POP’s Quiz” where your brain may get stump on categories such as Pop’s culture, Sports, Movies, Music and more, with little snippets of audio and visual effects too! It starts at 7:00pm ends at 10:00pm. So come on in for some good ole fashion competition and a night of drinking with the crew! It is a 2 dollar cover and winner gets the pot!! so tell friends and family because the more peeps the steeper the cash prize is!! Whatever Wednesday is YOUR PARTY, literally. You got DJ skills? Have you been itching to show ALL your friends? Its your turn to take over the night and mix it up. Send us your request, your best mix and we’ll see what we can do to get you your turn. 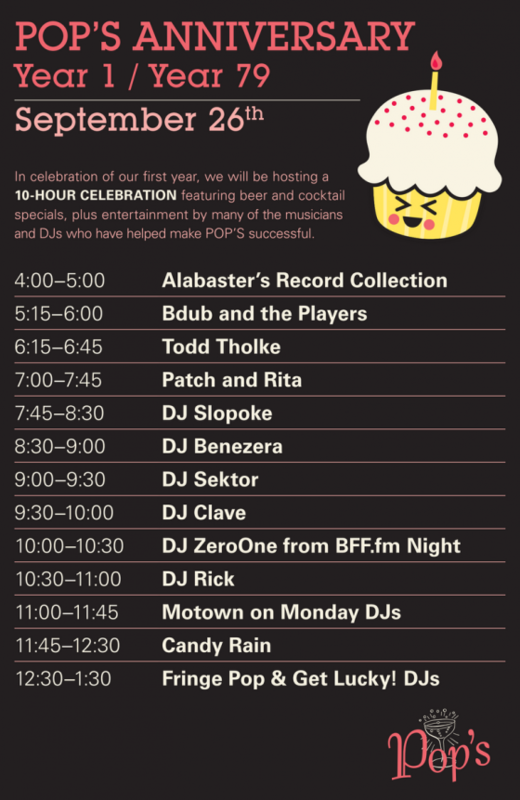 Rotating DJs from local BFF.fm radio! This week: Pops Anniversary Jam! We have many a musical cult to choose from, and every 3rd Friday, we do our best to honor them all. From T.Rex to Tinariwen, John Holt to Howlin’ Wolf, Baris Manco to Merle Haggard, Ann Peebles to Arthur Russell, Rza to Ranking Dread, Fania to Fela. Cult of Choice is hosted by a ragtag group of record collectors and music appreciators with the sole intention of sharing music with you. So come listen, dance, and even talk to us! We’d love to tell you all about who you’re listening to.